A fancy looking dessert, that does not involve too much work. 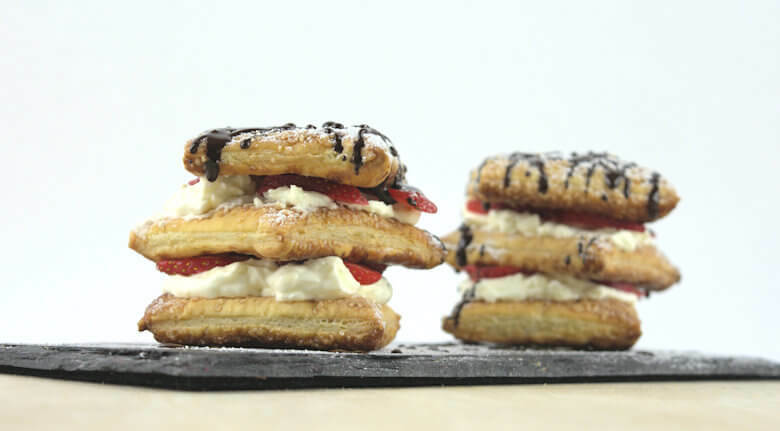 The Feuilletee with Strawberries & Mascarpone Cream is best when put together just before you plan to serve it, but you can prepare the individual pieces ahead of time. The key to making this dessert from OK, to really worth trying and serving, is prepping the pastry dough with a little bit of turbinado sugar. 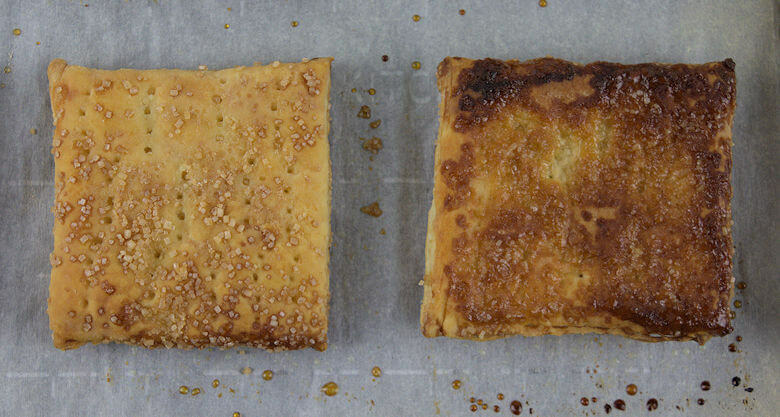 ‘Untreated’ pastry dough does not really stand out in flavor, but when you sprinkle it with sugar, press that into the dough with your rolling pin and then bake it, the sugar will caramelize nicely and will give the pastry a lovely flavor and crunch. So this is what you do. Thaw the pastry sheet according to the directions on the packaging, so you can unfold it and work it. For this recipe for 2, you will only need 2/3 of 1 sheet. Place the pastry dough on a lightly floured surface; sprinkle 1 tablespoon of turbinado sugar evenly on the dough and use a rolling pin to slightly roll it into the dough. Turn the dough around and apply another tablespoon of tubinado sugar in the same way. Cut the pastry dough in 6 equal pieces and transfer them to a baking sheet, lined with parchment paper. With a fork pinch holes in the dough, this prevents them from bellowing up like sky high pillows. Bake them for 10 minutes, then turn them over and bake for another 5 minutes. Both sides are now crispy and brown. One side is browner than the other, as you can see. The left side is the side that is baked for 10 minutes before we turned the pieces. During those 10 minutes, the bottom of the dough pieces got a little ‘sweaty’ on the reverse side. That side will be exposed in the next 5 minutes and because the sugar was mixed with some water (condensation) it caramelizes and becomes sweet and crunchy. While the dough is baking, you can make the filling; a combination of heavy cream and mascarpone cheese, equal amount; 1/4 cup of each. Whip the cream with a little sugar and vanilla extract until it holds peaks. Stir the mascarpone in a separate bowl to loosen it. Don’t overmix the mascarpone as it can become grainy. Then combine cream and cheese and the filling is done. Last part is the slices of the strawberries or any other fruit you would like to use. Also melt a tiny little bit of chocolate for the finishing touch and start putting your Feuilletee with Strawberries & Mascarpone Cream together. Layer 1: dough (caramelized side down); layer 2: cream mix; layer 3: strawberry slices; layer 4: dough; layer 5: cream mix; layer 6: strawberry slices; layer 7: dough. Dust with powdered sugar and drizzle with dark chocolate. Feuilletee with Strawberries & Mascarpone Cream done. A fancy looking dessert, that does not involve too much work. The Feuilletee with Strawberries and Mascarpone Cream is best when put together just before you plan to serve it, but you can prepare the individual pieces ahead of time. Thaw the pastry sheet at room temperature according to the directions on the packaging, preferable in your fridge. Line a small baking sheet with parchment paper. Place the pastry dough on a lightly floured surface and unfold; we're only going to use 2/3 of the sheet. Sprinkle 1 tablespoon of turbinado sugar evenly on the dough and use a rolling pin to slightly roll it into the dough. Turn the dough around and apply the other tablespoon of tubinado sugar in the same way. Cut the pastry dough in 6 equal pieces and transfer them to the baking sheet. With a fork pinch holes in the dough, this prevents them from bellowing up like pillows. Bake them for 10 minutes, then turn them over and bake for another 5 minutes. Both sides are now crispy and brown. Allow the pieces to cool. Prepare the filling. Cleaning the strawberries and cut them in slices. Put the mascarpone in a bowl and stir it gently to loosen it. Whip the heavy cream until it starts to thicken. Add sugar and vanilla extract and continue to whip until the cream holds medium peaks. Melt the chocolate in the microwave and start building. A piece of feuilletee, a layer of cream, slices of strawberry, a piece of feuilletee, cream, strawberry slices and finish with a piece of feuilletee. Dus the tops with powdered sugar and drizzle with some melted dark chocolate. Repeat to make the second. one.